Star Cinema Productions recently released the full movie trailer of the much-awaited Dawn Zulueta, Richard Gomez, and Bea Alonzo movie entitled, "The Love Affair" formerly known as "Crossroads." The movie marks the return of Bea Alonzo on the big screen after her successful box-office tandem with Dingdong Dantes in the 2013 hit movie "She's The One" together with Enrique Gil and Liza Soberano. "The Love Affair" movie also marks the come back of the iconic love team of all generation, Richard Gomez and Dawn Zulueta. Richard and Dawn's last movie together was the blockbuster hit "She's Dating The Gangster" where Richard Gomez and Dawn Zulueta played the role of adult Daniel Padilla and Kathryn Bernardo, respectively. The movie revolves around the intertwining stories of Vince (Richard Gomez), Tricia (Dawn Zulueta), and Adie (Bea Alonzo), who will find themselves at the “crossroads” of their lives. Will they ever find their happiness? Star Cinema Productions also invited ABS-CBN's former talent, Tom Rodriguez to play the role of the boyfriend of Adie (Bea Alonzo). Tom Rodriguez's last movie in Star Cinema was the mega blockbuster hit "Praybeyt Benjamin 2" starring Vice Ganda. 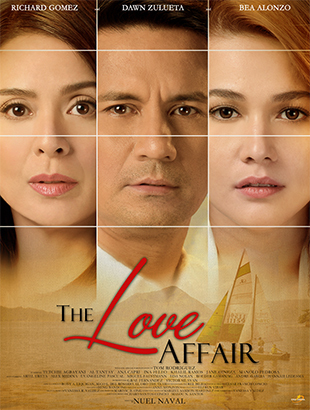 "The Love Affair" is directed by Nuel Naval, and coming soon in Philippine cinemas. Below is the official full movie trailer of "The Love Affair" movie.